It’s your wedding day and you’re looking fresh AF. We know you’re going to be stealing the spotlight anyway, but these dramatic wedding entry ideas, engagement entry ideas for the bride and groom really take it up a notch! Yoi can also incorporate them for your engagements when you are officially declared a couple! Light ‘em up: Have wedding guests hold up sparklers and walk under a shower of lights! 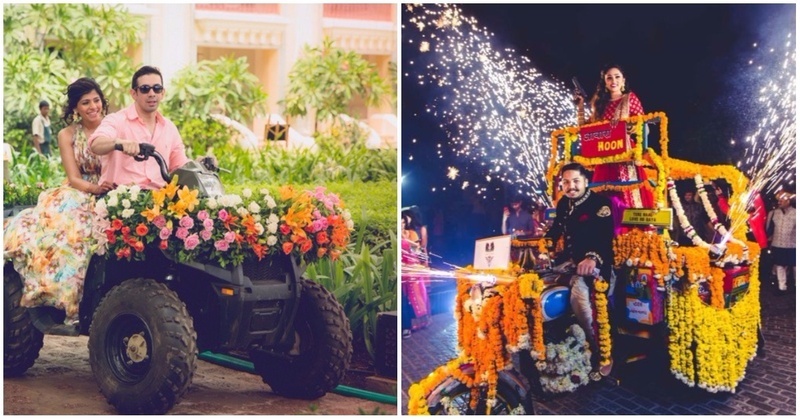 Ride in with your hubby-to-be on a motorcycle decorated to fit your Big Fat Indian Shaadi. A cycle-rickshaw works pretty well too as a unique wedding entry idea . Just make sure Mr. Right is willing to do the work! This zorb ball wedding entry is too cool! Make use of this wedding couple entry idea at your wedding in a zorb ball and nobody will forget it. Anisha and Hitesh made their bride-and-groom wedding entry in a golf cart! We love Anisha’s swag. Ok all of that is cool, but how awesome is this wedding entry in an ATV?! This is how you enter with a bang. Flower shower: Walk into your wedding under a shower of flower petals! I like this one. Sweet, simple and totally insta-worthy. Enter cinderella style in a carriage, drawn by horsemen/horseman. Oh, and your Prince Charming by your side! Take it up a notch with the bride and groom each entering on their own bikes! And now, with the bride bringing the groom to his wedding! xD I love this bride. Check out our blog for some awesome Indian wedding ideas!